Apple stock price has reached a 52 week high gaining an impressive 118%. But what are some of the factors behind these gains? Below I’m going to give you 4 reasons I believe we are seeing this upward movement of Apple’s stock price. Apple’s (NASDAQ:AAPL) stock price, currently at 237.32 +2.32 (0.99%) at the time of this writing, has seen an impressive run up over the past 12 months gaining 118%. Just this week, Apple stock hit a 52 week high and analysts are expecting the price to climb to as high as $284 this year. With the stock moving up 118% in just the past 12 months, there has to something fueling this investor enthusiasm! No doubt about it, investors are excited about the launch of the new iPad that is happening tomorrow. The Business Insider is reporting that Gene Munster at Piper Jaffray believes Apple will sell 200-300K iPads this weekend bringing his total unit estimate to 2.7 million in calendar 2010. He believes this may be conservative given strong initial demand. Munster says the breakout year for the iPad will ultimately be next year (calendar 2011) with 8 million iPad units estimated to be sold. He maintains his Overweight rating and $284 price-target. Mac unit sales are up an average of 39% year over year for the first two months of the March quarter, which according to Munster translates into sales of somewhere between 2.8 and 2.9 million Macs for the full quarter. The Street, he says, is looking for Mac sales to be up only about 22%. Rumors are out there that as early as June we could see the next generation of the iPhone, which will include 4G. Although these are rumors at the moment, the concept of a 4G iPhone might be seen as a legitimate possibly as far as Wall Street is concerned. 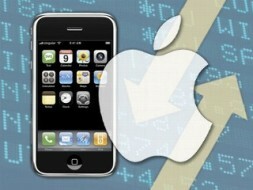 Along with the 4G rumors comes the possibility of Apple partnering with Verizon to sell the iPhone. This would mean that Apple is breaking its exclusive partnership with AT&T, and will dramatically increase the customer base for the iPhone. Perhaps the best scenario for iPhone fans is the concept of a 4G iPhone running on Verizon’s network! If nothing else, the thought of the iPhone (or a 4G iPhone) expanding to Verizon should have investors pretty excited. Customers are all but feed up with AT&T’s service. Calls on the AT&T network are being dropped in large metropolitan areas like New York and San Francisco. And it’s no doubt that Verizon has the better reputation for service and reliability. So those are the 4 factors I see that are pushing Apple’s stock price up 118% the past year as well as to a 52 week high. What do you think of my assessment as to what’s driving Apple’s stock price? Do you see other market forces at work with Apple stock?